This week's trip to a natural farm is, of course, inspired by Masanabu Fukuoka. During our first year here I ordered two books: F.H. King's Farmers of Forty Centuries and Fukuoka's One Straw Revolution. I dipped into Fukuoka's book first as it was most closely related to Japan, I'd just started helping on the farm here in Tokyo, and I was eager to learn everything I could. I didn't like it. C-chan, one of the farmers I work with, and I read it at the same time. Fukuoka sounded mad, like some guy who'd spent way too much time alone in the field. He rambled on about life, not farming, about nature and how crazy modern society was, blah, blah, blah. I forced myself to finish and tucked it on the shelf with a breath of relief. But what stuck with me were the descriptions of his fields, rich with life and sparkling with dew in the morning sun. I recalled how one year he'd noticed many spiders, and another year another insect seemed to dominate. I remembered how heavy his harvest was, and he developed his recipe for seed pellets. Each vegetable seed was encased in a mixture of dung, mud, and other ingredients that would give the seed all it needed to grow once it was tossed into the field. And I remembered how he talked about working with nature, seeing yourself as part of its whole and learning to integrate with it to not just survive but thrive. 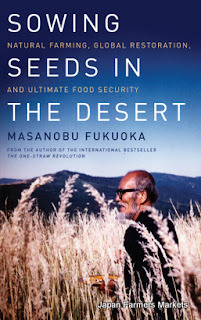 And then Chelsea Green Publishing sent me a review copy of Fukuoka's last book, Sowing Seeds in the Desert. It started with some of the same philosophical blah, blah, but this time I heard it with an ear better attuned to Fukuoka's ideas as he applied them on a global scale to alleviate desertification, hunger, and ultimately global strife. You can read my whole review at Permaculture Magazine, but suffice it to say that I recommend it.